New Year’s Resolutions are not just for losing weight, getting fit and eating less – they are just as applicable to your business as they are to you personally. But both have one problem in common…they just don’t stick. So how do we make GOOD business resolutions? By February (unsurprisingly) almost half of us will have ditched our New Year’s Resolutions in favour of that donut, cigarette or large glass of wine. Or in business terms, we will have reverted back to the “good ol’ way” of procrastinating, stuffing things in a drawer and burying our heads in the sand. Sound familiar? Unfortunately it happens all too often. But luckily for you, we have just what you need! Forget the January, and follow this guide to ensure you make GOOD business resolutions that stick, anytime of the year! …and don’t worry, the donut eaters can apply these techniques just as effectively! There’s no point in deciding your company goal for 2016 is simply to double your profits. It’s a great long-term objective but it’s too wide to be able to realistically make plans to achieve it. Instead you need to think of smaller steps that will/could contribute to the overall goal. For example, improve staff skills via training; try social media advertising or reduce company wastage. These are small steps, that will make a difference to that larger end target. You ideally want to make goals that you can track the progress of, so that everyone involved can gauge how well they are progressing. Having measurable goals will make reviewing and rewarding your efforts a much simpler task later down the line. There is no harm in aiming high but you need to ensure that the goals you set for your business are achievable. Setting your team tasks that are almost certainly unachievable is actually more destructive and will lower motivation and morale. In the same breathe, they still need to be challenging or there is no point in making them in the first place. It’s about balance. Similar to Achievable, this is about making goals that are rational and realistic to your business capabilities. 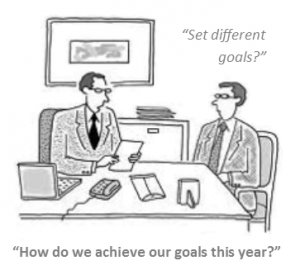 There is no point setting goals that are out of reach, and destined for failure as this is demotivating for staff and ultimately counter-productive to realising your resolutions. For example a micro start up company are unlikely to achieve the status of market leader by the end of year 1 – even if that would be the ultimate dream. It is good idea to set your business goals within a time frame. When do you want to achieve them by? Having open ended goals is a recipe for disaster as there is no pressure for them to actually be achieved. However they don’t all have to be achieved by the same point in time, there is no problem with having both long and short term goals built into your business plan for the year. There’s no point in keeping a good idea to yourself! Once you know what it is you want to achieve, it’s time to include your team. There is no end to the positives of sharing the company goals with your employees. First of all, they need to know what you expect from them going forward. If you are dealing with changes within you company, the chances are you will need your team to share the workload. Your team will feel valued, motivated and empowered if you make your plans for the business transparent. By including your employees you keep everyone aiming in the same direction you are and you also avoid losing the trust of the people who play a key role in keeping your company running. Another perk of including your team in the project is the chance to get another perspective. When you have been working on an idea continually either yourself or with the same team of people, it is easy to get tunnel vision. Sharing it with a fresh pair of eyes, may shed light on something you have missed. There is a difference between a resolution and having the resolve to see something through. Resolutions are essentially the statements of intent which is a great starting point, but having the resolve to continue with them is more about making a commitment. Resolution breakers that give up too easily, do so because the novelty wears off or other priorities take place. To combat this, you need to get in the right frame of mind. If you start to feel a loss of momentum, remind yourself of why you started in the first place and what the end goal will mean to your company if you are successful. Not to mention how good it will make you feel! It’s time to test your resolve…go ahead and see if you can solve the puzzle without losing your cool. You might feel like you have been making waves with your new resolutions but don’t forget to revisit your goals frequently. Only you can decide how frequent this should be. Daily, weekly, every fortnight? Whatever you decide, plan your reviews in and stick to them. If you made your goal measurable, assess how successful it has been and tweak if necessary. The review process also helps hold people accountable for their responsibilities, including yourself. If you feel like you are not making much progress with your business resolutions, it can make you feel extremely demotivated. Setting aside some time to review where you are at, gives you an opportunity to assess where improvements can be made. What you want to avoid is a culture of “We aren’t getting anywhere so what is the point?”. Set milestones and if you reach them, reward the people that made it happen – including yourself! Celebrate in a meaningful way and be sure to make specific mention of what has been accomplished, why it is important and how it has made a difference to the business. Not only does celebrating our successes boost morale and express gratitude to those involved, it reinforces our motivations for carrying out the next challenge. Tip: Don’t go overboard as you run the risk of making the reward “the norm”. This step is more about building a culture of appreciation in where your employees feel good about their continual hard work and contributions. If you were committed and organised enough to achieve what you set out to do, firstly congratulations! But the party doesn’t stop there. You now know what you can achieve so it makes sense to repeat this winning formula either to expand on the current success or to create new resolutions. If you didn’t reach your goal then it is important not to see it as a failure but as an opportunity to learn something about your business. Set some time aside to evaluate what went wrong. Were the goals unrealistic? Were your ideas for the company met with too much friction from key people within the business? Maybe you just didn’t have the time? By pinpointing the specifics of why you were unable to meet your goals, you can repeat these steps with some tweaks and adjustments to improve the likelihood of their success. Hopefully you have found our 6 steps on How To Make Good Business Resolutions. If you have any other hints and tips for creating and achieving great business goals then let us know!